March 6th, 1970. A 50-year-old blue collar worker walked into a local Los Angeles Police Department Precinct. The man who looked average for the time, hair combed in a part and tan from the California sun wanted to speak to someone about a crime. When pressed further the man produced a loaded handgun and placed it on the counter. He went on to confess that he and a teenage accomplice were responsible for a recent robbery and kidnapping of 3 young girls. His name was Mack Ray Edwards. Mack Ray Edwards shown in his mugshot. The kidnapping was a close call for the young girls, all former neighbors of Mr. Edwards. He and his accomplice had broken into their home during early morning hours after the parents had left. They stole a few items from the home, then abducted the girls ages 12, 13, and 14. The sadistic pair forced the girl to write notes before leaving, claiming they were running away from home. They were driven to the Angeles National Forest and since they were familiar with Edwards, one could only assume he would have killed them after he had finished torturing them. Thankfully 2 of the 3 girls were able to escape. This sudden change in plans caused Edwards and his accomplice to panic. They decided to flee the scene, leaving the 3rd abducted child behind and unattended at which point Edwards decided to stroll into the police department. He would eventually lead authorities to the girl and she would be found unharmed. A proud Edwards standing tall. One can only imagine what he was thinking about at the time. After the initial confession Edwards would go on to further stun authorities. He would admit to the brutal murders of 6 missing California children, many of whom were suspected of being runaways by authorities. The married father of 2, moved to Los Angeles in 1941 and started helping Caltrans build some of Southern California’s most prolific freeways. He would allege to have utilized some of his work sites as burial grounds for his victims. His first known victim would be 8-year-old Stella Darlene Nolan of Compton, CA. She would be abducted in Norwalk while accompanying her mother to her job on June 20th, 1953. Police had no suspects and had no idea if Stella was still alive at this point. After about a month, police would arrest the victim’s cousin, an unemployed 20-year-old who couldn’t keep his story straight. He would eventually be cleared of all wrong doing and released. A few months later, a teenager got police interest when he claimed to hold the key to the case. He was later found to be lying and quickly dismissed. Years would pass before Stella’s family would learn the truth. Just days after Edwards confession he would lead detectives to her body, underneath a local freeway. He claimed to have abducted the young girl, brought her home were he sexually assaulted her, and eventually strangled the girl. He would later dump the girl’s body over a bridge. Edwards would return to the dump site hours later, only to discover his victim was not dead. The strong, young victim was sitting up and was attempting to get away. He brandished a knife and began stabbing her, killing the poor girl. Pictures of Donald Baker & Brenda Jo Howell. On August 6th, 1956, 15-year-old Donald Lee Baker and 12-year-old Brenda Jo Howell disappeared from Azusa, CA. The pair were riding bikes together while Brenda was visiting family. She was actually the sister-in-law of Edwards and he told authorities that he paid Donald $7 to Bouquet Canyon. Upon arrival, Edwards claimed to have separated the two, then began beating Donald with a rock and proceeded to slice his throat. Brenda started to approach and Edwards panicked and killed Brenda shortly afterwards. A bike and a jacket belonging to the 2 were found but their bodies have never been found. Edwards tried to give the location to the burial site but search of the area yielded nothing. Edwards claimed to have taken a hiatus from murder for a few years and police did not believe him but they indulged him for now since he was confessing to so much. Over a decade later he would claim his next known victim. The next murder was that of 16-year-old Gary Rochet from Granada Hills. On November 26th, 1968, Edwards broken to a home with the intention of kidnapping Gary’s younger sister. He claimed he was startled by the teenage boy, shot him then fled the home. A picture of Roger Madison. A few weeks later on December 16th, 1968, Edwards would claim yet another victim. 15-year-old Roger Dale Madison of Sylmar, CA, left his home after an argument. He was lured to a nearby orange grove by a friend’s father, the father was Edwards. He claimed to have stabbed the boy multiple times and buried his body with a bulldozer under a freeway in Thousand Oaks. The boy’s remains have still not been recovered. The following year would see the final confirmed murder from Mack Ray Edwards. 13-year-old Donald Allen Todd was abducted form his Pacoima home on May 16th, 1969. He would be found near his home sexually assaulted and shot to death underneath a bridge. Donald lived in Edwards neighborhood and may have even knew his killer. Edwards would claim the following: “I have a guilt complex. I couldn’t eat and I couldn’t sleep and it was beginning to affect my work. You know I’m a heavy equipment operator. That long grader I’m using now costs a lot of money — $200,000. I might wreck it. Or turn it over and hurt someone.” Authorities did not buy this either. It was only out of fear of his escaped victims did he confess and law enforcement felt like there was more he was not telling them. After the shocking confession, Edwards would eventually be charged with the murder of the 3 children where bodies were found. He would plead guilty and was sentenced to death in 1971. Edwards would go on to say at his sentencing, ”I want the chair; that's what I've always wanted. My lawyer told me there are a hundred of men waiting to die in the chair. I'm asking the judge if I can have the first man's place. He's sitting there sweating right now. I'm not sweating. I'm ready for it." While in prison, Edwards may have soon found out how difficult it was to be executed in California. It took 3 attempts but Edwards would eventually succeed in taking his own life. First he attempted to slash at himself with a razor blade, then attempted to take an overdose of sleeping pills. Finally he was able to hang hisself with a television power cord in his San Quentin jail cell on October 30th, 1971. While in prison it was reported that Edwards could sometimes be braggadocios about his crimes, claiming as many as 20 kids according to an unnamed prisoner in an adjacent cell. Over 40 years have passed since his death and over 50 years since some of his crimes have taken place but his name still pops up from time to time in police departments across California. He is still suspected in a number of unsolved child murders that fit his M.O. The first of which was the March 23rd, 1957 disappearance of Thomas Eldon Bowman. Thomas was from Redondo Beach, CA and disappeared while on an outing with family in Pasadena, CA. The happy family was returning to their car when Thomas, like many other children decided to race to the car before everyone else. When the family got to the car, there was no sign of Thomas anywhere. A few days later, a letter arrived at the Bowman home and to local newspapers, claiming the boy was fine, being cared for and in Oklahoma. It was never determined who the letters were from but based on his attempt at making the kidnapped girls write letters, it definitely fits within Edwards profile. An author, G. Weston DeWalt, discovered new evidence that could potentially link Edwards to the disappearance claiming that Edwards strongly resembled a sketch of the man who could have abducted Bowman. He also discovered a letter that was smuggled to Edwards wife. He told her the following: "I was going to add one more to the first statement and that was the Tommy Bowman boy that disappeared in Pasadena, but I felt I would really make a mess of that one so I left him out of it." He also claimed to have been taking the blame for the crimes and that a man named “Billy the Cripple” was truly responsible. 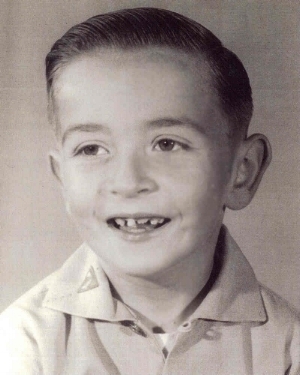 Edwards is also thought to be connected to the disappearance of 6-year-old Bruce Howard Kremen from Granada Hills, CA. Bruce was in the Angeles Nation Forest for a YMCA Youth camping trip on July 12th, 1960 when he started playing too far from camp. While out of range he simply vanished. Little evidence has been gathered in the case and authorities are also open to the possibility that Bruce had a tragic accident. Mack Ray Edwards is also suspected in the disappearance of two 11-year-old kids from Torrance, CA. Karen Lynn Tompkins disappeared on August 18th, 1961 and Dorothy Gale Brown disappeared on July 3rd, 1962. Tompkins disappeared after a local art class. She and her brother would usually be together but the brother had left early that evening. She was only walking a few blocks home but never made her destination. The second girl who disappeared the following year was abducted in Torrance and later found in waters off of Newport Beach. She had been sexually assaulted and thrown into the waters to drown. Authorities shown excavating potential dumping grounds of Edwards. Still trying to piece together his movements with his crimes. The list goes on and on. Mack Ray Edward’s timeline is hazy and no one really knows how many lives he ended and ruined through his sadistic sexual behavior and murderous appetite. Thankfully the last life he took was his own and he is no longer a threat anyone.